Immense impacts or big belches? A huge structure off the north-west coast of Australia1 has been identified by researchers as an ancient impact crater, and blamed for a mass extinction in the fossil record.2 Only this time they’re not talking about the dinosaurs dying off 65 million years ago. 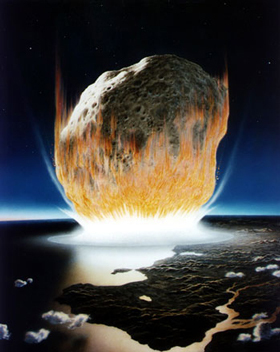 This particular blow from space is supposed to have caused an even bigger extinction, at the end of the Permian, some 250 million years ago. This is a level in the layers of sedimentary rock at which the fossils of many types of (mostly marine) creatures are found below it, but not above. Long-age philosophy is based on interpreting the fossil layers as a tape-recording of vast eons, rejecting the notion of a global Flood. So, starting with this framework, it is natural to interpret such a situation in the fossil ‘record’ as a ‘mass dying’ at a particular point in time. Accepting the biblical Flood record, on the other hand, gives a very different story. These marine creatures (and many others not around today) certainly did die out en masse in the huge hydraulic/volcanic/tectonic cataclysm of Noah’s day. The fact that they are not found above a certain sedimentary level would point to the physical/ecological realities of the event, not a significant separation in time. Same facts, different story. Many people are now aware of the ‘impact that killed the dinosaurs’, and of the evidence this alleged culprit left behind, namely the crater called Chicxulub on Mexico’s Yucatán Penin­sula. So some might argue that having two such large ‘smoking gun’ craters correlating with mass dyings is strong support for the long-age framework. However, before anyone gets too carried away, it’s worth briefly revisiting the history of the ‘dinosaurs-died-from-an-impact’ theory. The idea was proposed to explain a layer enriched with certain minerals (e.g. iridium) which are mostly found in objects from outer space. The layer was generally at the level in the fossil record where the dinosaur fossils petered out. Others pointed out that volcanism could explain all the features blamed on an impact, and found evidence of massive volcanism at the same ‘time’—the Deccan traps of India. Such super-large volcanic outpourings, theoretically capable of altering the ecology of the entire globe, are known as ‘flood basalts’. 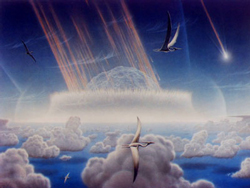 The Chicxulub crater was found only later, but was regarded as ‘proof’, especially in the public imagin­ation. So-called ‘shocked quartz’ particles, said to be diagnostic of powerful impact, seemed to settle the case. Still, some evolu­tionary researchers remained sceptical, arguing convincingly that it was unlikely that the Mexican ‘crater’ was from an impact, and also indicating that it was in the ‘wrong’ place in the record.3 Others argued that the fossil record overall showed (in the long-age framework) that dinosaur remains did not ‘suddenly’ go out of the record at all. Interestingly, just as the (final) dino­saur extinction is roughly at the same ‘level’ (hence time, in the long-age view) as the Deccan volcanism in India, there is a Siberian volcanic outpouring which can be correlated (in that framework) with the Permian extinction. There is a huge question-mark over whether these are impact craters at all, as discussed. No-one can think of a physical mechan­ism whereby an asteroid impact could cause such incredible melting on the other side of the earth. The time correlation is rough indeed, and even their own long-age dating methods suggest that the volcanism started well before the impact in each case. A new theory has emerged which tries to make sense of all these ideas for long-agers.5 It assumes that structures such as Bedout and Chicxulub are craters, but not caused by impact from outer space. Instead, they are the result of ‘Verneshot’ events. These are named after the ‘father of science fiction’, Jules Verne, who envisioned people being shot to the moon in a giant cannon. The idea is that deep volcanic/tectonic upheavals in the earth, associated with the formation of the huge flood basalts in each case, elsewhere caused an accumulation of gases, which then ‘popped’ or exploded with an incredible force. The energy of the blast would be that of millions of atomic bombs, and be capable of hurling billions of tons of rock into the air. Some of the chunks would be large enough to cause huge craters upon their fall to earth. So in this idea, the Verneshot explosion causes the layers of dust enriched in minerals, and would also spray shocked quartz far and wide. The initial ‘shot’, as well as the subsidiary impacts in other parts of the globe, as the larger chunks hit the earth with huge force, would contribute to the climate disruptions blamed for mass extinctions. As would, of course, the flood basalts associated with the ‘super-belch’. The idea is still very raw and controversial, but already it illustrates how flexible scientific interpretations can be in accommodating data. One generation is told ‘for certain’ that ‘we know’ that an asteroid impact killed the dinosaurs, but then it becomes volcanoes, and now—well, let me tell you about this super-belch … . Proponents of the Verneshot idea will now start searching for evidence in Siberia that will suggest that there really was such a giant ‘shot pipe’ associated with the volcanism. Of course, regardless of whether this particular hypothesis keeps gathering pace, the facts will, as usual, be shoehorned into the long-age philosophy. But consider the things being discussed: global-scale catastrophism, with deep earth upheavals, huge explosions sending mountainous chunks of rock half-way around the world, outpourings from super-volcanoes, and mass extinction. Leave off the millions of years, and it all sounds very familiar to Flood geologists! How many impact craters should there be on the earth? The alleged crater is at what is known as the Bedout (pronounced ‘bed-oo’) High, and is about 200 km (125 miles) wide. Return to text. Signs of crater linked to mass extinction said found, Science News <www.sciam.com/article.cfm?chanID=sa003&articleID=0002C42F-DB79-10A3-9B7983414B7F0000>, 10 June 2004. Return to text. Book Review by Wieland, C., of Officer, C. and Page, J., The great dinosaur extinction controversy, TJ 12(2):154–158, 1998. Return to text. 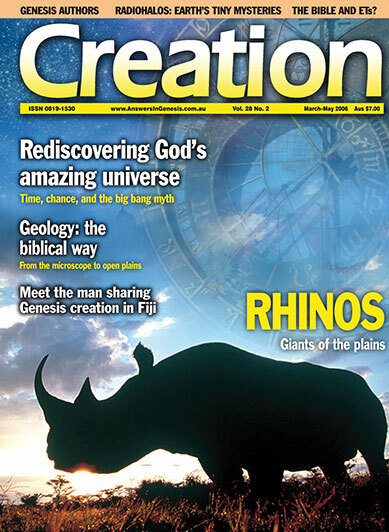 Wieland, C., Dino-impact theory takes a hit, <www.creation.com/dinoimpact>, 27 May 2004. Ravilious, K., Four days that shook the world, New Scientist 182(2446):32–35, 8 May 2004. Return to text. This volcanic island near Indonesia exploded in 1883 with a force heard as far away as 4,800 km (3,000 miles). It killed thousands of people. Other volcanic blasts have been bigger, such as Tambora (1815) and Santorini (1500 BC), but the Krakatoa disaster is the best-known today. 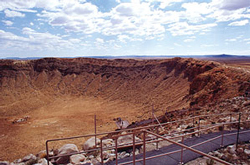 A famous tourist attraction, Meteor Crater, sometimes known as Barringer Crater, is in Arizona, USA. About 1.2 km (4,000 ft) across and 174m (570ft) deep, it was formed when a meteorite approximately 50m (150ft) in diameter smashed into the ground with the explosive power of a 20–40 megaton nuclear weapon. The meteorite itself was composed of nickel-iron and weighed about 300,000 tons. It was vaporized on impact after travelling at around 64,000 km/h (40,000 mph) into our atmosphere. This is many times the speed of the fastest bullet from a high-speed rifle. The largest man-made bomb ever detonated was a nuclear device of 50 megatons (equivalent to 50 million tons of TNT), detonated over the arctic island of Novaya Zemlya in the former Soviet Union in 1961. It was roughly 6,000 times more powerful than the Hiroshima bomb of 1945. The shock wave travelled three times around the earth and destroyed wooden buildings hundreds of kilometres away. This crater was originally estimated to be 150–250 kilometres (100–150 miles) in diameter and believed to have formed from an asteroid as much as 10 km (6 miles) across, weighing nearly a trillion tons. There is some doubt as to whether it is actually an impact crater. But if it is, then the energy equivalent to the explosion caused by an impacting body of this size would be about 100 million megatons, six million times bigger than the Mount St Helens volcanic explosion in 1980, or about 10,000 times the world’s total nuclear arsenal at the height of the cold war!